These trails are one of my favorite places to train on and visit. This race is run in the beautiful awesome foothills of El Dorado Hills. 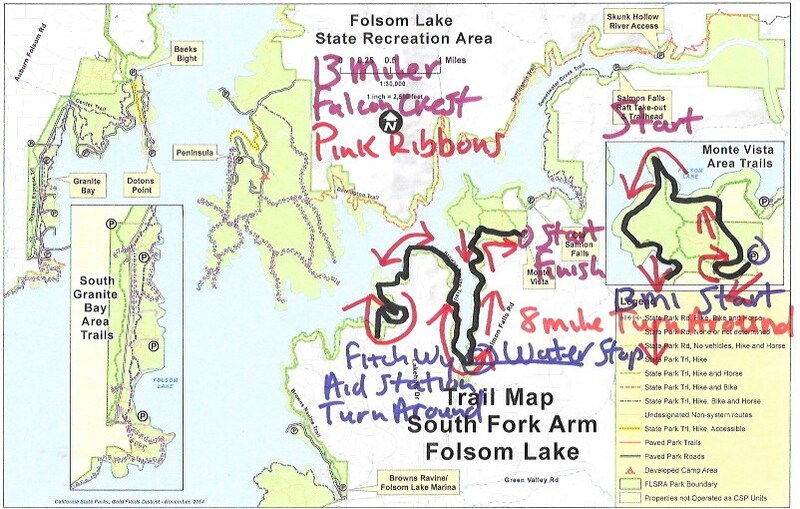 This area has incredible oak trees, green grass and is loaded with single track trails paralleling Folsom Lake. The trails are fast to run on and have some technical sections too—lots of fun. Some shaded areas and lots of exposure as well. 6:00 AM: Staff arrives for set up. 6:15 AM: Runners check-in. Race day registration, pick up shirts, bibs and pins. 7:15 AM: Trail briefing at the start/finish. Follow PINK Ribbons the entire course. 13 milers you will have 3 aid stations. 8 milers 1 aid station. 13 & 8 milers first aid station just before the New York Creek bridge up the hill 50 yards on your LEFT. SIGN POSTED: ” AID STATION up hill to LEFT”. 13 milers you will run across the New York Creek bridge 2.4 miles to the Fitch Way aid station turnaround. 13 milers follow YELLOW into the Fitch Way aid station. 13 milers after returning back to the New York Creek aid station you will run 2.5 miles then turn RIGHT onto the Monta Vista Trail continue to follow PINK RIBBONS, SIGNS, & gypsum to the FINISH. 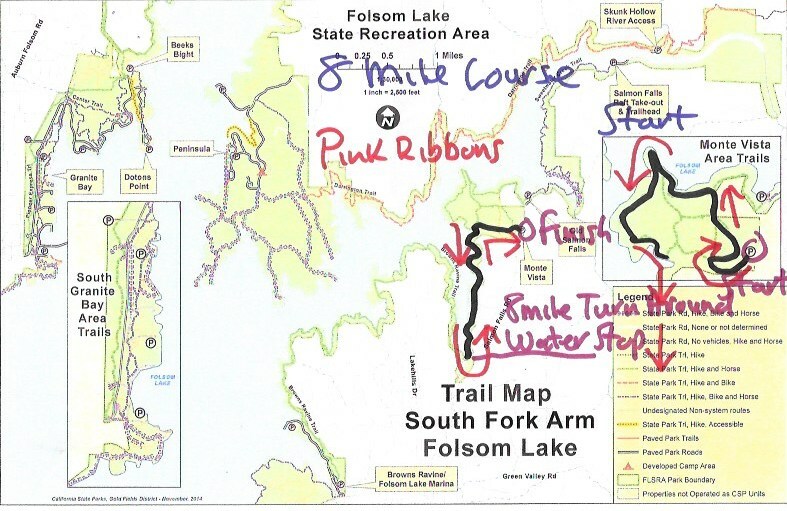 At 7.4 miles you will turn RIGHT onto the Monta Vista Trail continue to follow PINK Ribbons 0.6 miles to FINISH. Signs 8 milers. 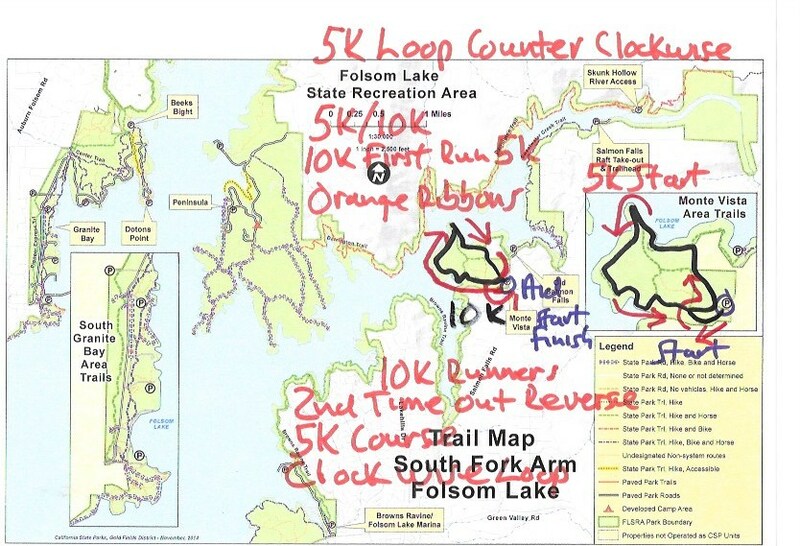 You will first run the 5k course ORANGE Ribbons following 5k signs a COUNTERCLOCKWISE LOOP. 10k, 5k ORANGE Ribbons & follow 5k signs. At mile 2.4 you turn LEFT onto the Monta Vista Trail 0.6 miles to FINISH. 10k runners you will have 1 aid station at the finish. You will first run the 5k course when returning to the finish. Please use your aid station then turnaround & REVERSE THE COURSE YOU JUST RAN following ORANGE RIBBONS. 10k RUNNERS, after leaving your aid station when you go back out, you will now follow 10k SIGNS. New York Creek aid station CREW ACCESS OK. Very limited parking & a curb to get over into parking area. 13 milers Fitch Way aid station CREW ACCESS OK.
13 milers: Three aid stations along the course in sequence. New York Creek aid station. Fitch Way aid station turnaround location for the 13 milers. THREE aid stations.You will hit the New York Creek aid station twice going out & returning to the FINISH after turning around at the Fitch Way aid station. The New York Creek aid station is located 100 yards before New York Creek bridge when your running out on your LEFT up a trail 50 yards leading up to Salmon Falls Road. Follow YELLOW Ribbons INTO & OUT of the aid station. ONE aid station New York Creek aid station your turnaround before New York Creek bridge 100 yards. New York Creek aid station is located 100 yards before the New York Creek bridge on the left while running out 50 yards up a trail leading up to Salmon Falls Road. Follow YELLOW Ribbons INTO & OUT of aid station. ONE aid station located at the Start/finish.10k runners you will first run the 5k course you will return to the start where your aid station is then go back out & reverse the 5k course you just ran following ORANGE Ribbons now following the 10k signs. From Hwy 50 exit at El Dorado Hills Blvd: go underneath the Hwy drive on El Dorado Hills Blvd for 4 miles. At the Green Valley traffic light cross over Green Valley road onto Salmon Falls road. Drive on Salmon Falls road for 2.9 miles. Falcon Crest parking lot will be on your left. Here is a link to a map of the parking area. Parking: Parking is in Falcon Crest parking lot. Please carpool. Parking is limited. Additional parking below in the Old Salmon Falls parking lot, a five minute walk. Please DO NOT PARK ON THE ROAD LEADING DOWN TO THE OLD SALMON FALLS PARKING LOT. See map of parking area here.